The delay the cool weather posed in the ripening of my heirloom tomatoes meant that I had two plants — Isis candy and rosalita — that were covered with green, small-fruit tomatoes. I just couldn’t bring myself to abandon them to frigid fall. So, in came two tomato plants that I hoped would ripen next to my glass sliders — bathed in the sunlight from a southern exposure and warmed by gas-forced heat. I would show you a photo of the plants, but with mixed brown leaves and straggly stems resulting from the low-40s temps they suffered before being brought in, they look sorta sad. The fruit, however, is looking good and there is a daily crop of tomatoes to take to the table. I must say, though, that what the pitiful-looking plants detract from my interior decor is offset by the amusing sight of my domesticated feline winding his way through the pots like a big cat prowling the bush. 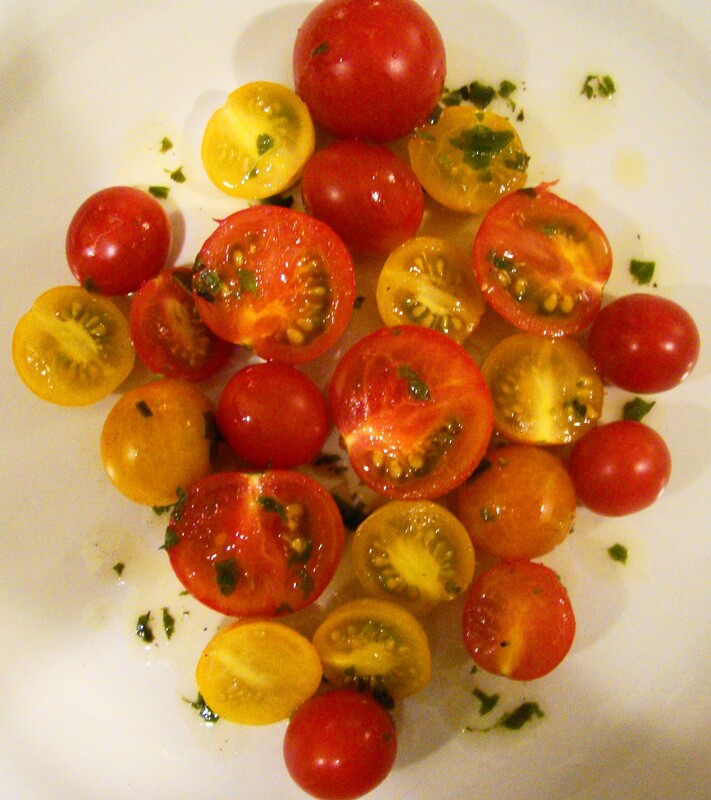 Heirloom tomatoes with lemon basil vinaigrette: Rinse off heirloom tomatoes and dry. Slice the largest in half and arrange on a platter. For the vinaigrette, combine 1/4 cup champagne vinegar, 1/4 cup lemon basil leaves and 3/4 cup olive oil in a food processor or blender and pulse. Add kosher salt and freshly ground black pepper to taste. Spoon over the tomatoes and serve. I would also like to see the picture of tomato plants… as another blogger wrote: the good, the bad and the ugly. I promise to take a photo of the brown leaves on the tomato plant and include it with a later post about things that disappointed in this year’s garden. Cheers! It is cool that you’re extending the season by bringing them indoors and continuing to get some tomatoes. I think I’m definitely too squeamish about bugs to bring plants in! Love your vinaigrette though – and also the arrangment of the tomatoes. I like the idea of slicing the larger in half. Very pretty. Champagne vinegar? Champagne vinegar! I had no idea such things existed and now I must have some and I must have it NOW! I wouldn’t have thought to bring the tomato plants indoors. I would have just taken the green tomatoes off the plants and hoped they would ripen on a windowsill. Now your plants can hopefully go on producing and extending the season. Your vinaigrette sounds like the perfect accompaniment. Regardless of what the plants look like, those are some gorgeous, delicious-looking tomatoes. Kudos for bringing them in to ripen. Hope they keep producing for you!